Environmental flows (E-flows) are defined as the quantity, timing and quality of water flows required to sustain freshwater and estuarine ecosystems and the human livelihoods and well-being that depend on these ecosystems’ (Brisbane Declaration,2007). Why do we need E-flows ? People are dependent on wetlands which include rivers, lakes, marshes, floodplains and other freshwater ecosystems! There are many “services” including natural products like fish and the water itself that we obtain from these systems to survive. These ecosystems also help us remove wastes, protect us from floods and give us places for spiritual activities. When the health or integrity of these ecosystems decline the availability and quality of the services we obtain from these ecosystems declines. We also care about the wellbeing of other components of the ecosystems including the animals, their habitats and ecosystem processes that keeps them together and gives us the services we depend on. We need to establish E-flows to tell us how much water we can use and how much water we need to leave in the ecosystems to sustain ecosystems and the human livelihoods and wellbeing. PROBFLO is a holistic e-flow assessment tool that incorporates regional scale ecological risk assessment methods in a robust, tested approach, for the evaluation of the social and ecological consequences of altered flows on multiple spatial scales. PROBFLO has been used throughout Africa to establish E-flow requirements for rivers and other aquatic ecosystems. This has been done on site scales, for river reaches and on basin scales. With PROBFLO we have contributed to the establishment of suitable balances between the use and protection of water resources. This includes tradeoff considerations between ecological and social endpoints. 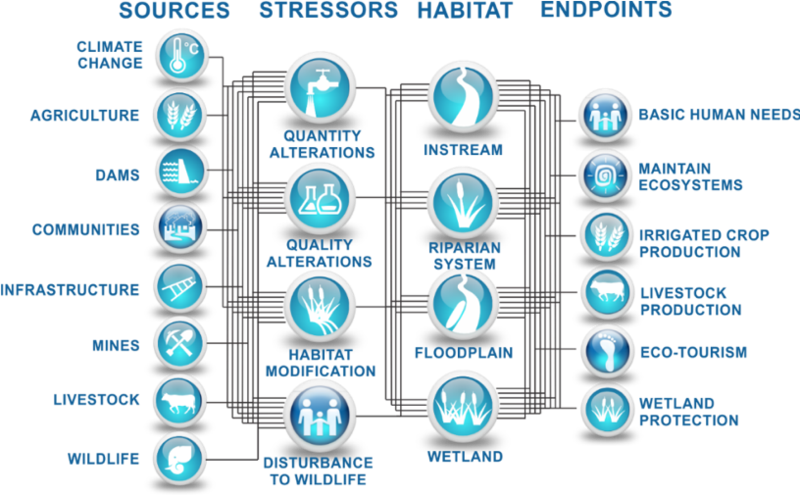 The PROBFLO framework can be used in adaptive management to direct monitoring, improve the understanding of the effects of water resource use and ultimately better manage water resources for the benefit of our environment and the people who depend on these ecosystems.